Media's portrayal of drug use: Effective reporter or passive enabler? As we say goodbye to Eid al-Fitr, let us turn to a grimmer matter also relevant to last week. On June 26, the International Day Against Drug Abuse and Illicit Trafficking marked to acknowledge the very real presence of drug abuse on a global scale. 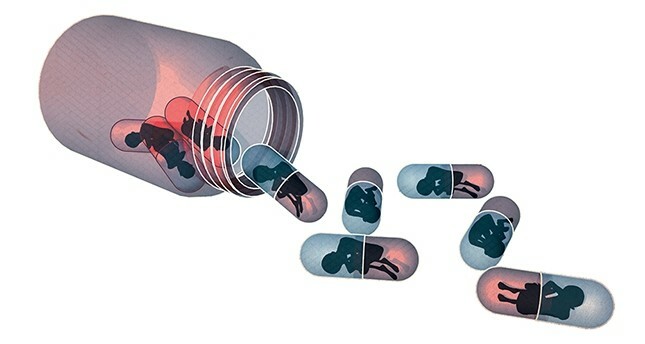 As the average of children who engage in illegal drug use has become as low as 14 years old in Turkey, this fact is made even grimmer with the alarming statistic which indicates that 36 out of every 100 children who have been taken into custody for drug use were reportedly using addictive drugs. As access to synthetic drugs has become easier and cheaper in recent years, the number of deaths resulting from substance abuse is also on the rise. In 2015, drug abuse was listed as the cause of death for 580 people in Turkey. Anything that happens in a country has a relation to the media either directly or indirectly. At least it should have. Ajans Press, a media monitoring company that operates from within Turkey, has reported that in the first half of the year, a total of 39,896 news articles were circulated in the media on substance abuse. Furthermore, this number stood at 32,379 in 2016. Therefore, it appears that there has been a significant increase in just one year. In spite of this, there is another question this raises: How many of these articles have been published in accordance with the principles of the ethics of journalism? To find an answer to this question, we spoke with Sultan Işık, vice president of the Green Crescent (Yeşilay), taking a crucial look at the matter while seeking answers. As a non-profit organization established in Istanbul in 1920, the Green Crescent works to fight child use of cigarettes, alcohol and other addictive drugs. Işık relayed some of her evaluations to me and provided information from the Green Crescent's education program, prepared for the media. - In articles prepared on the subject of illegal drugs, young drug users are described by the media in a passive way, defined as "trapped, in the clutches of drugs, victims, and young children." This should stop. The problem of drug abuse in society is portrayed as exclusive to some sub-cultural groups; namely, children from shattered families and homeless children. Not only is this wrong but it is also extremely marginalizing. This practice should be abandoned. - The media describes drug abusers as drunks, potheads, pill-heads, dope fiends, junkies and the like, failing to effectively offer a solution to the problem and instead amplifying the issue. The same goes for the emphasis placed on the behavior itself, with the media focusing on the behaviors of people "under the influence." While this is an easy option for building news articles, it is the wrong approach. We must remember that addiction is a psychological illness that can be cured. There must be more emphasis placed on finding solutions in these articles and even on TV shows, seeking methods available to help drug users. The families and loved ones of those who use drugs should also be considered. The number of articles and TV shows that aim to explore how to recognize the problem and solutions must increase. - Positive news stories, exemplary actions, positive words and optimistic stances should be emphasized for positive reinforcement. Focusing on the temporary effects of pleasure derived from drug use could push those in high-risk groups to substance abuse. The effects of drug use must not be glorified. Drug habits, addictive behavior, pleasure-inducing substances and "golden shot" are all descriptions that are wrong and actually promote drug abuse. The same goes for mistaken sayings such as, "it won't be addictive," "it will help you lose weight" or "it will increase your creativity." Describing drug traffickers and leaders of illegal organizations as "fathers, barons, aghas, big brothers, and et cetera." must also be completely avoided. It must be emphasized in the public that these people are criminals and enemies of the community instead of being given humanized titles. It appears that reporters and editors who tackle stories on addiction should also be familiar with the sociological and psychological factors surrounding the subject. If news stories are published haphazardly and without attention to the necessary principles of journalism, the media becomes a cowardly observer, partner in crime and, in some cases, even an enabler that unknowingly encourages the behavior. I know that it is hard to accept this fact and why wouldn't it be? After all, it is a very serious and weighty accusation. However, as the people of our country die slowly before our very eyes, we must accept responsibility for this human tragedy and start doing the right thing as journalists. There is no other option as the "status quo" is not sustainable. Işık also provided information on the efforts and programs of the Green Crescent in the context of this fight. I thank her, both for her insight and for the opportunity to turn the spotlight on the problem.